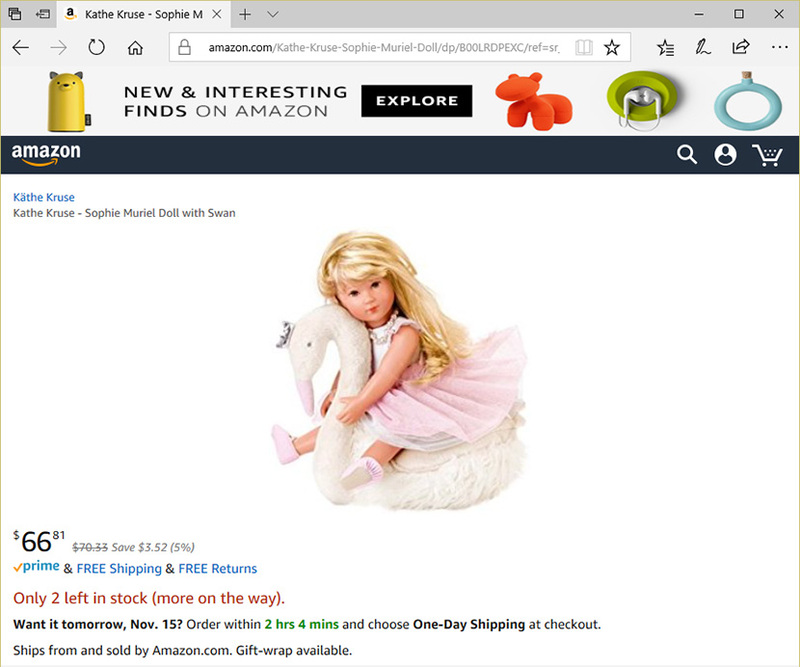 A premium German brand doll wholesale cost $100 and retail of $200 sells for $66.81 on Amazon. Without dispute, Amazon has built and operates an attractive platform optimized for selling just about anything. And, that platform is incredibly effective, gathering more than 50% of initial searches for prospective buyers. That’s a hard statistic to ignore. Only a few years ago, Google was king of product search and it was the primary way to get in front of consumers’ eyes. Amazon has a closed ad platform allowing only ads for products that are actually listed within amazon.com. It’s not possible to create an ad that links to a product on your own web site. It is a genius arrangement for them because if gets product manufacturers thinking that if they want to be in front of consumers’ eyes, they must list products on Amazon. And for Amazon, they get the ad revenue in addition to the commission revenue they receive when your product sells on their platform. But before you jump your premium brand to Amazon, consider how the platform works, do the math. History is littered with premium brands that went to Amazon for more sales and found their brand damaged by the mathematics of mass fulfillment and retail. A premium brand is one that demands a premium price either; by virtue of perceived value, by intentionally limiting production quantities, or by integrating premium materials and craftsmanship. Mass retail runs on moving products from manufacturers to consumers. If that conveyor stops or even slows then there is a problem because the revenue stops or slows. A public company like Amazon needs to show increasing revenue figures and hopefully increasing (or at least steady) profits. Lets look at a metric that becomes important in situations like this – the cost of shelf space. Unlike a company generating revenue because of direct efforts of employees, mass retail generates revenue by product entering and exiting shelf space. Employees, lights, insurance, …, are relatively fixed cost overhead. So instead of looking at revenue per employee, revenue per linear measurement of shelf space is an important metric. For instance, the more shelf length available, the more product can move in and out and therefore the more revenue generated. The shelf becomes the important variable and the main contributor to revenue. When employees are the main contributor to revenue, you must make sure you have productive employees and those who are not are shown the door. The same idea holds when the shelf is the main contributor to revenue. Empty shelves are not providing revenue; shelves with product taking up space but not moving also are not providing revenue. These must be shown the door – but you can’t just throw out a shelf that is not performing. Supply and demand economics tells us that if the supply is too high (static product on shelves) then either the supply must be reduced (sending product back out the door it came in) or demand must increase. Of course there are many ways for a brand to increase demand, but these are not of interest to Amazon. The Amazon variable is price. So when shelf space is not performing, the Amazon price decreases to increase demand. Just for an example, let’s say that a 3 foot length of shelf in an Amazon fulfillment center has a cost of $10/month. (Take all of the fixed costs of the fulfillment center and divide by linear shelf space.) If this space holds 10 widgets each with a cost of $50 and a suggested retail of $100, then if one is sold per month, the shelf space is earning $50 (widget profit) – $10 (shelf cost) = $40 / month. A smart mass retailer would desire to find the optimum retail price for monthly profit. Perhaps, priced at $75, 3 widgets are sold per month rather than just one. Then the shelf earns $25*3 – $10 = $65 / month. Certainly better for the mass retailer, more revenue and more profit. We could make lots of cool graphs and get even deeper into the math, but that’s not the point of this article. The foundation is laid, let see what happens when our premium brand ends up on an Amazon shelf. Premium brands have fixed prices and are seldom or sometimes never discounted. But if no other controls or agreements are in place, when placed on the Amazon shelf the fixed price is forced into variable. Another aggravating factor is when a brand also allows its retailers to sell on the Amazon platform. This shows up as “Other Sellers on Amazon” some of which can also be fulfillment by Amazon. In this case, Amazon has your product on its shelf and one or more of your retailers may also have the same product on an Amazon shelf. When there is a somewhat fixed demand, adding more of the same product to consume more linear shelf space makes this problem even more difficult – the downward price pressure is immense. One of the worst things a premium brand can do is to teach consumers and admirers of the brand that it can be found at a discount. Just wait or delay your purchase and you’ll find the price 25%, 40% or even 60% off! This is the situation that is nearly guaranteed to occur when your premium brand finds its way unto an Amazon shelf. And this is the very definition of Amazon brand damage – teaching your brand followers to wait for discounts. This is tremendously difficult to recover from. You must teach brand followers again from scratch why your brand is premium and why it deserves the premium price. Otherwise you find yourself with a used-to-be premium brand.